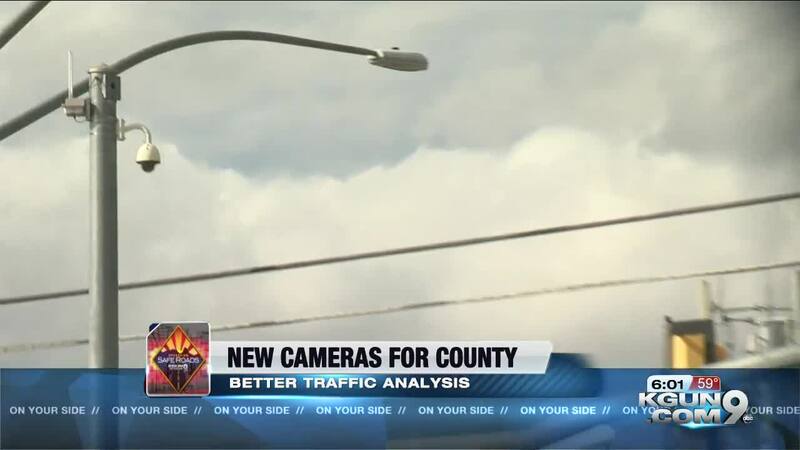 TUCSON, Ariz. - Pima County is talking about putting more cameras up -- at major intersections, but they have nothing to do with giving you a ticket and everything to do with helping you get across town faster. Let's get something out of the way now. This sort of camera is not meant to write you a ticket. It just tells the system when your car's at a red light---and takes the place of the old system that requires tearing up pavement to put a sensor under the road. This is the story of something much newer. These cameras give Pima County transportation planners a 360 degree view of everything coming and going through an intersection. Pima County traffic engineer Michelle Montagnino says, "You can see how traffic is arriving is arriving. It's picking up the traffic. It classifies it too so we can get traffic counts out of this and we know how many vehicles are arriving." Montagnino says the County already has the new cameras at 30 intersections. The County Administrator is asking Supervisors to approve them for all of the county's 103 major crossroads. A memo from County Administrator Chuck Huckelberry spells out the plan in detail. A lot of traffic engineering used to be based on notes on a clipboard. The system from a Canadian company called Miovision would be an enhancement to systems the County has already bought from the company. The system, collects data around the clock and helps engineers recognize when streets feeding into the main roads are busy enough to justify more green light time. Montagnino says, “We take that information, we fine tune our timing and hopefully make improvements to shorten delays, especially for the side streets and keep people moving on the main line." "The system also has the ability to pick up your cell phone but not to record any sort of personal information. Tracking your cellphone gives the system an idea of how well you are moving across town. In fact Google Maps already uses a similar system to detect traffic congestion. The full system should cost $1.17 Million dollars but the payoff for drivers could be faster, smoother, safer trips, and the chance to save tax money, because smart traffic management can move more cars without adding more pavement.